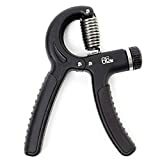 The 66fit Adjustable Hand Grip Exerciser allows you to adjust tension from 10 – 40kg. Suitable for anyone who requires to increase their hand strength, with the added bonus of being able to increase the tension as your stength improves. As your strength has increased – simply increase to the tension.